TVB is known to be a place where romances start. 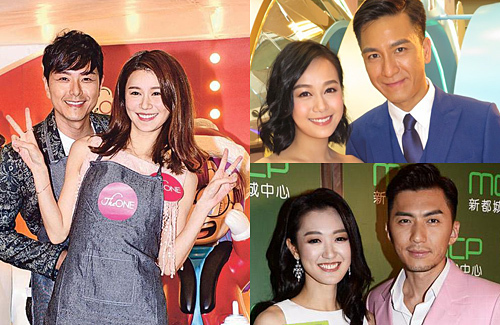 With TV King Ruco Chan (陳展鵬) marrying Phoebe Sin (單文柔) today, many wonder which TVB artistes will likely get married next. The two became a couple after the filming of Madam Cutie on Duty <師奶madam> in 2014. Though they have been dating for four years now, they prefer to keep their relationship low profile. Rumor has it that Edwin minds being called a “billion dollar son-in-law” due to Priscilla’s family wealth, so he does not want to start a family until he can secure his own finances. Recently, Edwin has been given many lead roles and hosting opportunities, which has assisted with his marriage funds. With their stable relationship, they could potentially be the next TVB artistes to get married. Though there is a 15 year age gap, Jacqueline was still able to capture Kenneth’s heart in 2015 during the filming of Inspector Gourmet <為食神探>. It has been over three years of dating, but Kenneth did not truly announce their relationship until 2017. Just last month, Kenneth brought Jacqueline to Kevin Cheng’s (鄭嘉穎) birthday party and their friends already addressed her as “sister-in-law”. To add, she already met his parents so could there be wedding bells ringing soon? Benjamin and Bowie’s relationship began to blossom from the 2017 variety show All Work No Pay Holidays 2 <打工捱世界II>. Unlike many celebrities, this pair was very open about their relationship. Though Bowie has been a target of negative news in the past, Benjamin constantly supported her and would stand up for her through online platforms. The two are inseparable as Bowie attended Benjamin’s father’s funeral as a family member. Currently, the couple went to Japan for vacation with Benjamin’s mother. Though their relationship is quite passionate, the two expressed that marriage won’t happen for another few years. 3 comments to Which TVB Couple is Next in Line for Marriage? I have to said Edwin and Priscilla are the next one to get married? What about Matt Yeung and his gf? Definitely on the cards too. I quite like Edwin Siu & Priscilla’s pairing, mostly because Edwin is so charming lol. And their relationship feels very healthy & genuine. So I ship them!